As you know, I’m on an information detox at the moment. Everyday I unsubscribe from approximately 4 newsletter/email shots. (Wow – they really did build up over the years!). I have moved all my inspirational books away from my bedside table and down to the sitting room, (thanks for that advice, Lesley). I can’t recommend this enough. It has been wonderful to regain some head-space. When I ran workshops based on Julia Cameron’s book ‘The Artist’s Way’ I knew that week 4 of the 12-week course would always be the most challenging. Why? Because that was the week that participants were asked to cut out all outside input in the form of TV, Radio, books etc. It was such a picture to see everyone’s faces when I announced this: “You mean, I can’t even read the newspaper in the morning? I HAVE to do that. How else will I keep informed?” Yet, if people trusted the exercise and did banish all reading and watching, it proved to be huge. Suddenly they only had themselves to listen to. Suddenly they could hear what their heart was really saying. Suddenly those cupboards that they had been meaning to clear out for years, finally got cleared out! It’s not that all media input is bad – of course not. It’s just that we can so easily lose perspective when we are surrounded by these outside voices. In this ever-expanding, increasingly open world of ours, I personally think this is going to be one of our biggest personal challenges in the future. In the video below, Peter Diamandis gives a stirring speech about why we can expect abundance in the future. It’s well worth a watch – especially if anyone is of the mindset that we’re ‘going to the dogs’. But what I’m also interested in is the question: How do we equip our souls to deal with this kind of abundance? Will we develop increased powers of Presence to go with the explosion of opportunities and choices available to us? We’re talking about the need, here, for a whole new spiritual abundance to go alongside the physical and technological explosion. I’m optimistic because, so far, spiritual awareness and practice has expanded exponentially. It’s very exciting to think what this could mean for spiritual innovation in the future. On my bedside table there lies a secret hazard. Not pills, not booze, not false teeth – self-help books. Oh what a lot of amazing stuff there is out there! So much insight and wisdom. It seems the inspirational gold is coming in thicker and faster than ever before. The downside is that I find myself drowning in it all. The problem is drawing a line between that which serves us and the loss of our own self-trust. It’s all too easy to relinquish our power to other’s advice and stop listening to ourselves. So for my own sanity right now I’m putting it all to one side: the books, the emails, the audio downloads, the knock-em-dead online courses. Just temporarily, mind, because it IS all great stuff. But it’s time to listen more deeply to myself for a while and to regain my perspective. The fact that I’m needing this head space in order to write my own book at the moment is an irony that is not lost on me. I can only hope that my eventual addition to the positive psychology soup is one that clarifies rather than muddies! We’ve had a lovely time with family and dear friends this weekend but in between times Guy, the kids and I have all been a bit snappy with each other. Roll on the Christmas holidays – I think we’re all in need of slowing down. I don’t know what it is about this time of year but I always feel that we’re not alone in pushing ourselves too hard in November and early December. I think June is like this too – lots of push-push and outward focus. But then comes late December and July/August – times when we more naturally take a breath and come back to ourselves. 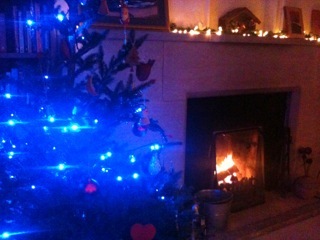 Our tree is now up and tonight a fire is burning in the hearth. “Come”, they say, “time to focus on family, home and heart”. …would love a happiness post on dealing with Christmas, I feel very mixed about the whole business, and the pressure of “presents’ and expectations, real or imagined. Ah yes, Christmas! ‘Tis the season to be jolly. Jolly busy. I sympathise with Kelly who lives in Canada because, it has to be said, many North Americans do go a bit bonkers with it all. If you want to skip sending out Christmas cards this year – by all means! If you want to go to the Bahamas and forget it all – spread your wings and fly. If you want to visit family in the spring rather than dashing around like a mad thing now – that’s OK too. It’s far better that you do what really appeals to you than to spend your time scowling over the fatted turkey. Your relatives will have a much better time without you, to be frank! What I love about my family is that we all do our own thing with the present buying. Some go lavish, some buy in second hand shops, some buy online, some make things by hand, some don’t buy anything at all. (We’re a big family!) I remember one year we all received presents from the ancient contents of my brother-in-law’s mother’s attic. She’d recently had a clear out and saw an opportunity. Wonderful! So what do you REALLY want to do this festive season? Claim it as your own. It’s much kinder to everyone involved to have a happy version of you participating (or not!) – than to expect them to deal with you feeling all bitter and twisted about it. Choose your version of things and have a jolly good time doing it! New moon yesterday – oww-woooo! no homemade bread = time to quieten down and get grounded!